As spring gets closer, I’m finding myself bringing more and more of the outdoors in. And by “bringing the outdoors in,” I mean the fake outdoors in. You all know that I can’t keep plants alive, and I imagine that ordering real eucalyptus leaves would be pricey. 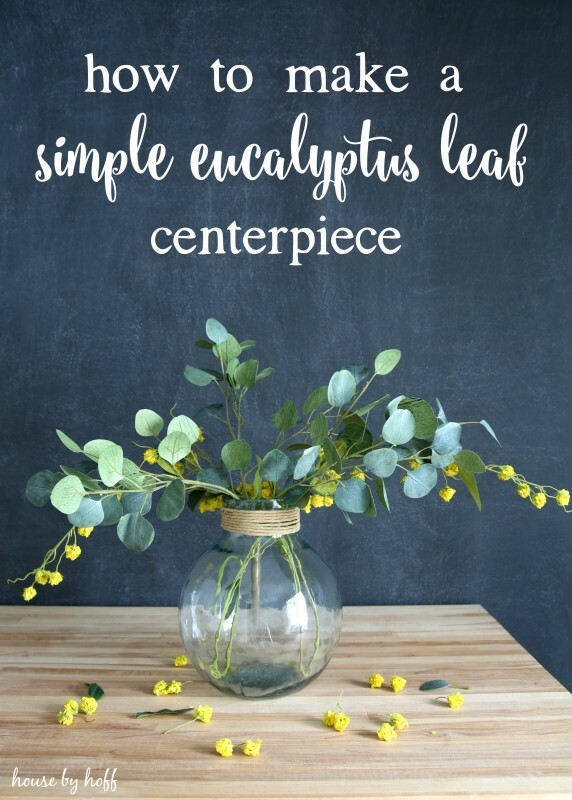 I have been seeing the most gorgeous eucalyptus centerpieces on Instagram lately, and I was inspired to try and create a fake and inexpensive version of my own. 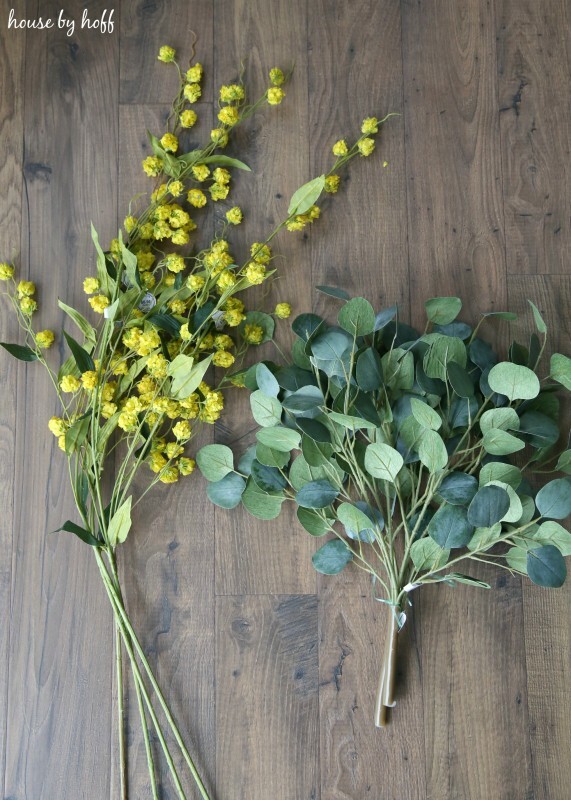 Hobby Lobby had 50% off their stems and florals last week, so I picked up these yellow blooms and the eucalyptus leaves pretty inexpensively! Woohoo! 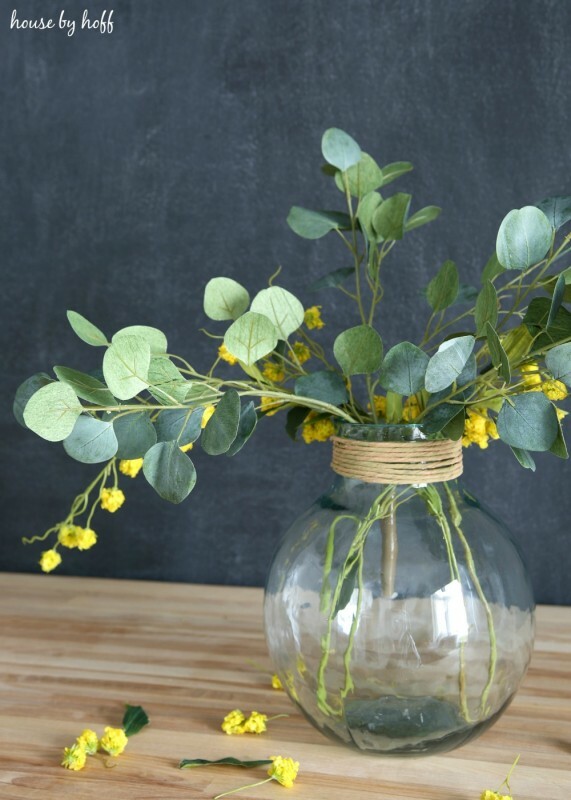 I only ended up using two yellow floral bloom stems and one eucalyptus stem for this particular arrangement. 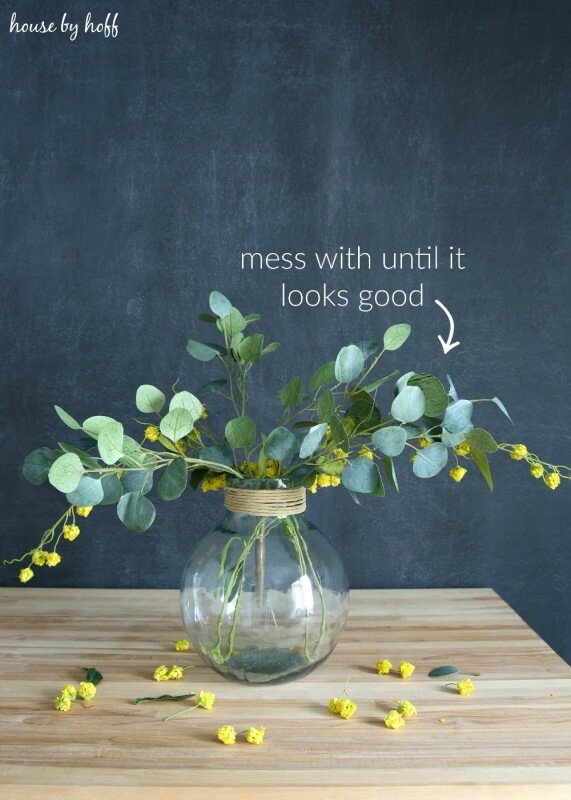 I am not very experienced or talented in the art of flower arranging, but I knew I wanted this arrangement to take on a very casual and informal look. 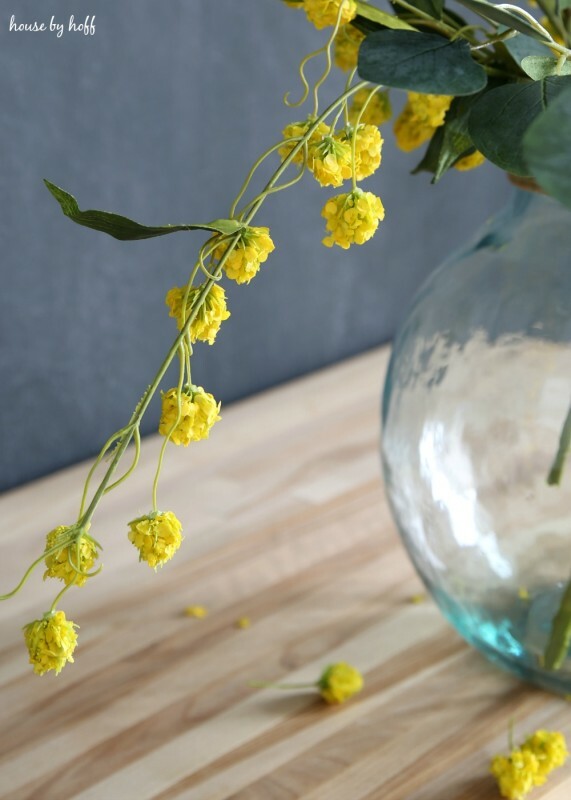 I wanted the long stems of yellow blooms to look almost lazy…does that make sense? I bent and looped the long stems a few times until I achieved just the look I wanted. 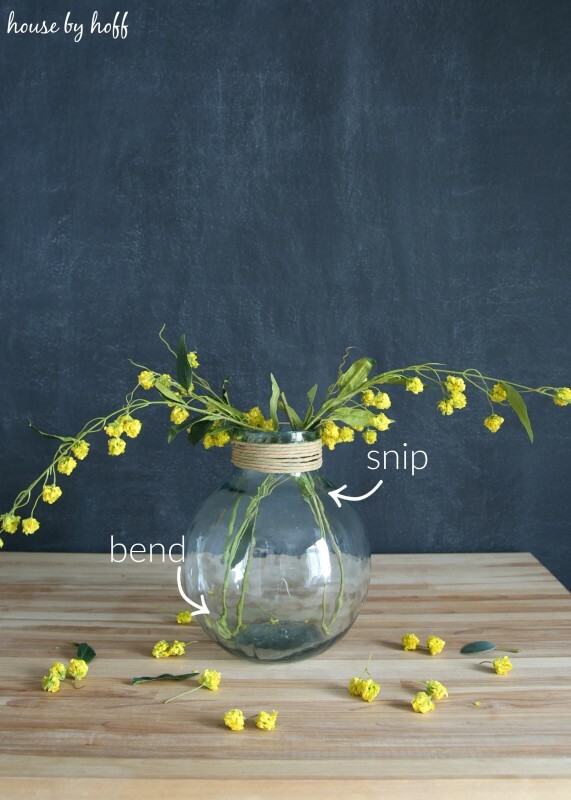 Then I snipped off any yellow blooms that were showing inside of the blue vase. 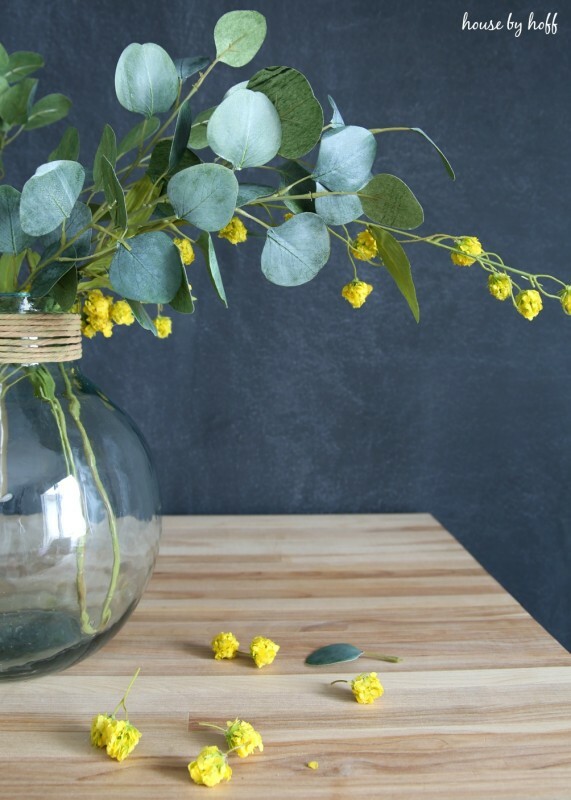 *Note, if the look of bent and/or looped fake floral stems bother you, then don’t use a transparent vase. This look doesn’t really bother me, but I could see how it might not be everyone’s favorite look. Next, I placed the eucalyptus leaves in the center and messed with them until my arrangement looked how I had envisioned it in my head…I sound so professional, don’t I? Wow! 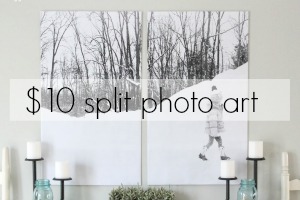 From seeing the main picture I definitely thought that the eucalyptus was real! 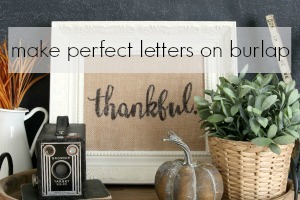 I need to go to hobby lobby and grab some of those! I love this arrangement! I’m a huge fan of greens especially eucalyptus because I love the color and texture. If you want the real stuff, Trader Joe’s has bunches of it all the time for only $2.99!! It’s my go-to place. I add it to flower arrangements all the time, and when it’s alone it dries out fairly well. 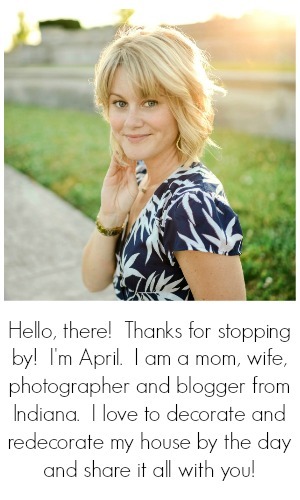 Super pretty, April! I love the soft grey green of the eucalyptus! I LOVE the arrangement!! You’ve inspired me to create one for my table. Where did you find the great vase? I love the jute around the neck! Thanks!